Coming into Mae Haad Pier, a few things will catch your eye; the beautiful natural collection of rocks, set against the palm-laced forested mountainous terrain almost-but-not-quite hiding the many small wooden chalets dotted around, the little boats scuttling to and fro from both sleepy bays and excellent little coves. Koh Tao is South-East Asia's answer to a Carribbean Isle for sure. 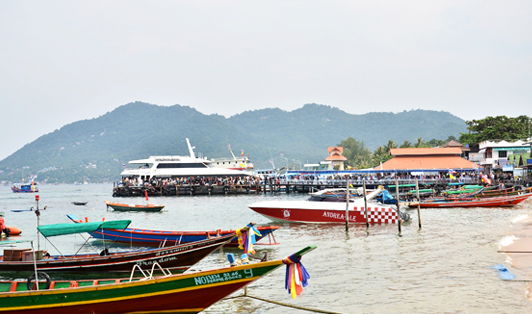 With Koh Tao's reputation for being a glorious tropical diving centre of the world, you'll see laced along the Mae Haad Pier area an interesting and colourful assortment of diving/tour boats, but there's always a prime docking point for our ferries to make it easy for your embarkation/debarkation. Once on dry land, there's the usual assortment of restaurants, bars, 7-11s and a huge amount of dive shops (yep, shop around till you find the one for you!). Mae Haad itself is one of the busiest areas of Koh Tao, so you'll not be lacking for island resources. Stock up on your adventure gear and hit the trails.